Here you can find some programs for the C65. Currently i am exploring the V10 Basic, but i will get to assembler soon, so better programs will follow. Programs are downloadable both as standard PRG file (hold shift while you click on the link!) for transfer with Star Commander and as ASCII text. SCREEN-SAMPLE ... This is the sample-program of the screen commands (def, set, open, close) of basic V10 from the C65 user manual, chapter 3. I typed it in with all comments and saved it to disk.Read the source. GFXDEMO1 ... This is a little demonstration how to do a formula-based computer graphic using the graphic commands of Basic V10. Man, they did not include a PutPixel command in the 65 basic, so i had to use the 'line' command to set pixels.. =:-() time for assembler..Read the source or view a screenshot. 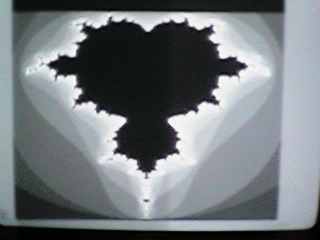 MANDELBROT1 ... A Mandelbrot program wich calculates an 'apfelmaennchen' with 320x200x64cols (45 iterations). The calculated graphic can be saved to disk (in no standard format, using the BSAVE comand to save screenmem in bank 0 and bank 1. Read the remarks in the basic-source for further details. Read the source or view a screenshot.